The stack of magazines caught my eye at our local secondhand shop. They were old copies of “Taste of Home” that someone had collected over the years and finally discarded. I had never heard of the magazine before, but its “home cooking style” looked right up my alley. I had been on a recipe kick at that time, satisfying my usual urge for new ideas in the kitchen with books upon books from our local library. So happily I paid my few dollars and took the stack home with me. Over the next few months, I poured through the old copies, finding many recipes that suited our family of seven well. When I started to get close to the bottom of my pile, however, I began to wonder if the magazine still was still in print. And after a search on the Internet, was glad to find out that it was both thriving and wildly popular among other home cooks like me. Today, I’m a volunteer field editor for the “Taste of Home” magazine. I upload a new recipe to their website each month, review their existing recipes and am even on hand for local media should the magazine need a representative. “Taste of Home” feeds my longstanding desire to create good things in the kitchen. I guess to me, it all represents food, family and togetherness. Maybe that’s why the article, “God’s Recipe for Life and Health” caught my eye the other day in “The Word of Faith” magazine. The recipe, from the late Pentecostal preacher Kenneth E. Hagin, didn’t include things like eggs and flour, but instead offered the necessary ingredients for a good life. I liked Hagin’s way of pulling apart Proverbs 4:20-22 to give us a solid recipe for a good life. It definitely trumps any other option there is out there. Good recipes can be hard to come by, even in home cooking. I can’t tell you how many I’ve tried that haven’t made our “favorites” list. Not too long ago, my kids fell in love with “stuffing balls” after eating them at a local sports banquet. I tried hard to duplicate the stuffing balls we ate that day and failed each time. When speaking about my dilemma to a woman at our church, she said she had a good recipe and would pass it along to me. The week I received it, I put it to the test. And it passed! I finally found what worked for my kids. 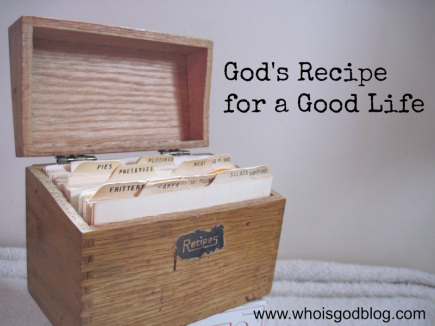 Have you been looking for a recipe for a good life? Maybe you’ve tried a lot of “duds,” but none of them has offered you the result you’re looking for. I can wholeheartedly agree with Hagin that God’s way to life and health is the best you’ll ever find. And it’s a way better discovery than even my recipe for chocolate lava cake! 11 Love the Lord your God and keep his requirements, his decrees, his laws and his commands always.